You have to dance your way to the finish in order for your character to claim the power of the Groovetron. You can attack up to two times in a round in order to try to throw off your opponent. The way you determine who is ahead is how the camera angle is during regular dance time (not solos or attacks). The harder movements are located in the lower bar. Try to keep up with what the bar says, the better combos, the better scores. Check out Duane's tips for more on this. High Scoring Moves! These are moves that can be preformed during solos. I found this list on the anime playstation site. 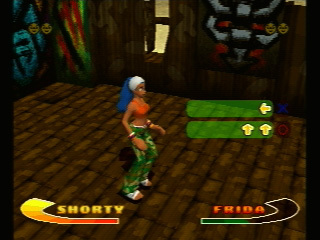 Perform these moves during each character's solo dance section. Secret Characters Play through the game on normal and you are given the Capoeiras. 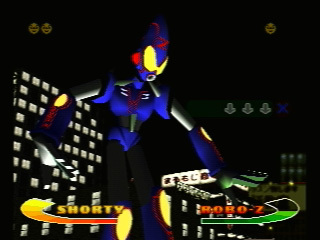 Play the game through on hard to get Robo Z. 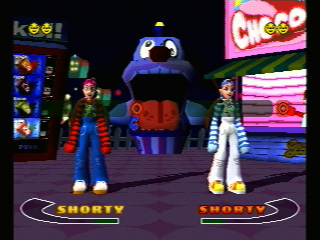 After you have the Capoeiras and Robo Z, you can play through with Shorty to get Columbo and Hamm to get Burger Dog on the normal difficulty level. Dance Preview Option Play the game through with any character in any difficluty level and you can get their dance previews. Alternate Outfits To select a character with their alt outfit, push select and then "O". This also works in the dance preview mode.